When it was cold and wet, I wrote a blog, which seemed like a good idea. I still think it is a good idea, but I have been gardening this week so here is a quick update. After we got a dog, it mainly rained for a year - something to do with the Jet Stream being too far north. I don't think the dog was involved in the weather, but he galloped around in the garden and pooped everywhere. The grass got very tall in the constant rain, then large patches of it died of dog. He is, however, very cute, so I have forgiven him now we have a dog proof fence to stop him galloping on the flowers. It has also stopped raining and what is more, it is quite warm. At last! which is nice, because last year was their year off. I didn't realise they would both choose the same year when I bought them, so every other year we have to buy apples. I trained this tree which is a pitmaston pineapple into an S shape so that it would blossom more. It is doing well this year, maybe because of all the rain. It has tiny yellow apples which taste - you guessed it -of pineapples. They mostly taste of apples so they are not strange, just a bit unusual. There are Oregon Thornless blackberries growing over the arch. I am so glad they are thornless because they grow 16ft or so a year, and this weekend I was wrestling with the stems, trying to tie them in so that they didn't take over the world. In the background is an elder tree which I use to make elderberry syrup for colds. It's very effective and also strangely expensive for something made out of a hedgerow plant. If you buy it in the health food shop it costs about £8.00 for 120ml (or $12 for 4fl oz if you are in the USA). I generally make it by the wine bottle full - which are great for preserving since screw tops came in. This is a box tree. My other half says its a pear, but we will have to see what happens when I next trim it. I haven't decided. 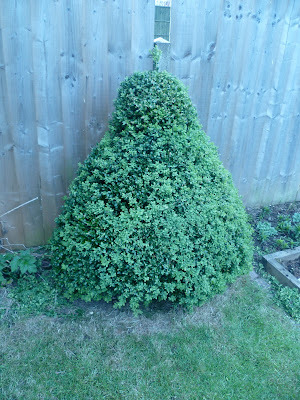 It's so exciting making topiary! It might turn into a rocket, or maybe some kind of hat. Who knows? Watch this space! Normal life continues. School beckons.